Microsoft and the creators of South Park have had a pretty solid relationship. We've seen a ton of content on the Xbox Live Video Marketplace, some for free, for quite some time. Now a new game published by Microsoft and developed by Doublesix has hit Xbox Live Arcade. South Park Let's Go Tower Defense Play! 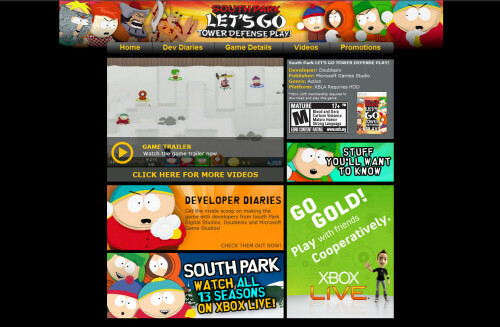 brings the tower defense genre to the town of South Park, complete with four player co-op play. You'll be defending various turf from the Ginger kids while controlling one of the four South Park characters by placing baseball pitching machines and other structures around. You can also throw snowballs as an extra line of defense. Some think the tower defense genre is a bit over saturated, and that may be true, but South Park brings some new tricks to the table. The most notable of these is the four player co-op levels for both online and offline play, which should add a spark if things have gotten stale for you. If that doesn't work perhaps the blood, gore, and foul language will help. One interesting thing we noticed was the focus on Xbox Live Gold and Co-Op play on the game's splash screen (seen above). Bravo Microsoft for focusing on a play style we all know and love in your marketing. South Park Let's Go Tower Defense Play! is out now for 800 and you can download it right here. Page created in 1.0955 seconds.